Skills required: Cast on, knitting, purling, increasing, decreasing, yarn over, knitting in the round, three-needle bind off (explanations provided). Construction: This vest is worked seamlessly in the round from the bottom-up, starting with the garter and leaf hem. The work is then divided for front and back, which are worked flat separately. An optional pocket can be worked. Its lining requires some seaming. Note: 10/23/2017 This pattern has been updated. The main change is that the neckline has been raised. 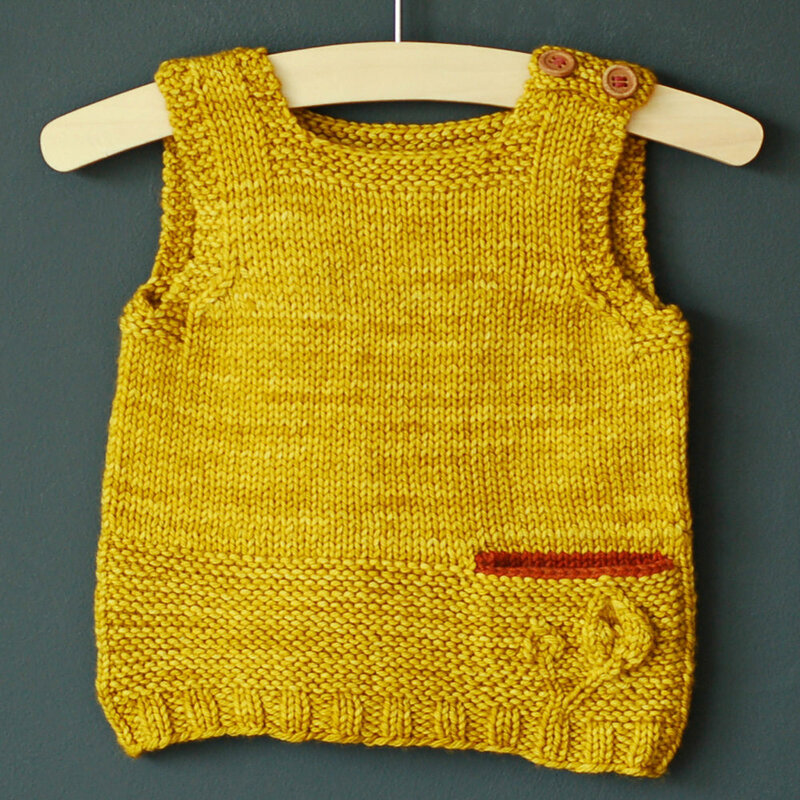 The Petites Feuilles Vest is an easy, fun knit that is perfect for layering. With its adorable constrasting secret pocket (optional), it’s also great to use up leftover yarn and it lends itself to many color combinations. The shoulder buttoning ensures that the garment is easy to put on and off. To fit chest: 16 (17, 18, 19 // 20, 22, 23, 24, 25) inches or 40.5 (43, 46, 48 // 51, 56, 58, 61, 63.5) cm. Finished garment chest: 17.5 (18.5, 19, 20 // 21.5, 22.5, 24, 25, 26.5) inches or 44.5 (46.5, 49, 51 // 55, 57, 61, 63, 67) cm. of dk to worsted weight yarn. About 15 yards or 14 meters of contrasting color yarn in similar weight (for pocket option). US 8 or 5mm 16-inch or 40cm (note: for sizes 4yo and larger a 24-inch or 60cm length may be more comfortable) circular needle or size needed to match stockinette gauge. Extra US 8 or 5mm needles or double-pointed needles (for pocket).